My interest in the writing-in-the-disciplines movement grew out of my experience with students in the Science Program. Although these students are required to produce lab reports on a regular basis, they do not tend to improve at writing discipline-specific prose as they progress from semester one to semester four. This is especially disheartening given the considerable time and effort invested by teachers to read and provide feedback on written work. There can be little doubt that students require better instruction in how to make and defend an argument. My WID portfolio follows on the heels of a previous WID fellow and colleague from the Physics Department, Jean-François Brière (see his portfolio here). We team-teach an optional course to fourth-semester students, usually from the pure and applied science stream. The primary objective of this course is to provide an introduction to computer programming with some applications to the natural sciences and engineering. As the range of possible topics is vast, the course is well suited to a term project with an intensive writing component as its final evaluation. To make convincing arguments as to the validity of their approach. To respond to criticism and defend or refine their ideas in light of comments from peers. Over time, the project has evolved to include three main components: a blog where students present their work-in-progress, a peer-review process whereby students provide feedback – both positive and negative – to other groups, and the final conference material (software, manuscript and presentation). Research on the links between writing and deep learning suggests that effective assignments share three characteristics: they include interactive components, they focus on a meaning-constructing task, and they provide clear explanations of writing expectations. We have tried to incorporate all these elements in the design of the term project. The main idea behind so-called “interactive” components is to provide students with opportunities for feedback and a chance to refine or to rework their ideas without penalty. As an example, class time is reserved early in the project for one-on-one meetings with teachers to brainstorm research ideas and to perform preliminary Internet searches of the available literature. This kind of informal session is repeated twice as the project progresses and is the primary vehicle for direct feedback from teachers. Feedback is also solicited from other groups through a formal peer-review process. A blog is used as the medium for presenting short (usually less than 500 words) progress reports and as a forum for comment and criticism. Groups are required to submit pieces on defined topics (e.g. the research question, an overview of the relevant theory, the numerical approach, etc. ), which are critiqued by other members of the class. In general, each group comments on the work of two other groups and responds to all criticisms they receive. It is worth underlining that while students must respond to all comments, they do not have to agree. This kind of activity is central to meaning-constructing tasks as it encourages active critical thinking by all parties. Beyond the utility of interaction, introduction of a peer-review component exposes students to another facet of the research world and hopefully inspires the students to write with the perspective of the reader explicitly in mind. As suggested by Bean, meaning-construction tasks can be made more effective by explicitly providing students with a RAFT (i.e., define the Role, Audience, Format, and Topic) and a TIP (i.e., Task as Intriguing Problem). Although the format of the project covers all these points in a very natural way, the handout given to students emphasizes these elements <link to handout>. In addition, the handout spells out our expectations and addresses some specific weaknesses that, over time, we have noticed in our students. For example, students often have considerable difficulty framing their work as a research project and so we include concrete examples of “good” and “bad” research questions. In our experience, explicit modeling like this helps to focus student work during brainstorming sessions. Students also have little to no experience with providing criticism and we provide some hints as to how to go about critiquing the work of others. Of course, the evaluation rubric is also given as part of the handout. One might expect evaluation to be tedious with so many groups completing so many small writing assignments. To lighten the load, we have the students maintain a log and self-report their contributions to the group blog at the end of the semester. While we were sure to keep an eye on developments on the blog, we did not see a need to read every entry or reply. In the end, the blog serves many purposes. At the very least, it is a permanent record of the students’ work and the development of their project. On a more pedagogical level, it helps to develop an in-depth response to a research question by encouraging students to get writing early and often. The blog also operates on an emotional level: the nature of the project forces students to be more or less responsible for developing their ideas and the semi-public display of their work seems to foster a sense of ownership. This might be especially true for the stronger students. 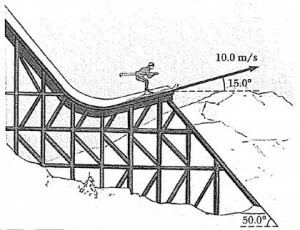 The link below leads to a blog entry describing the scientific and numerical approach adopted by one group to model the flight of a ski jumper. Although the prose still needs some refinement for the final report, the post is nonetheless quite detailed and shows the depth and quality of their work. Critique: Your project looks interesting, and the source is quite extensive! It looks like there are quite a few things that will have to be simplified, like making the wind uniform, making the actual power yield of the turbine a % of the power used to turn it, etc. Is the wind going to be coming in form an arbitrary direction, or will the turbine be equipped with mechanisms to make it turn in the optimal direction? Also, how will you incorporate the shape of the blades (for example, to take care of moment of inertia if that’s needed) into the program? Rebuttal: There are equations that will give the lift and drag forces without needing to calculate the moment of inertia of the blade. 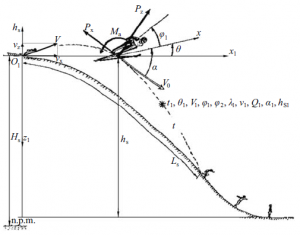 Calculating the moment of inertia of the blade would be hard because of its asymmetrical shape. In addition to this, we will have to calculate the power that is generated by many points on the blade. The power cannot be calculated simply for one point on the blade. As for the direction of the wind, I will be looking at a problem which will specify certain angles but for the most part, the relative angle of the wind will be calculated in the program. What is interesting in this exchange is that the reviewer has asked some reasonable questions based solely on the content of the writer’s blog post. The reviewer has not really identified the major difficulties in the proposed work, but that does not matter much. The peer-to-peer interaction forces the writer to independently identify the important aspects of the problem they are working on which is a valuable academic exercise on its own. It is clear from the rebuttal (to an expert) that the writer still hasn’t ironed all the details out for themselves. More importantly, the student likely realized when preparing their response that there were still some gaps in their understanding. At its heart, the goal of this project is to get students thinking and writing independently. With this in mind, it is worth underlining the fact that the teacher is entirely peripheral to the peer-review process. The introduction of a blog as a medium to present and develop student ideas has been clearly beneficial. Most notably, it has helped to improve the quality of final submissions by getting students writing early and through the peer-review process. As course enrolment grows and the content of the blog becomes even more voluminous, our aim is to increasingly rely on peer-to-peer interactions and less on direct teacher-student feedback. It seems perhaps contradictory that less direct instruction could lead to better quality work, but we are starting to see evidence that supports this possibility. While we will likely continue to fine-tune the structure of the blog (e.g. the formation of working groups, the number of peer-review cycles, the timing and quantity of student writing, etc. ), it is certain that it will play a central role in this course for the foreseeable future. Anderson, P., Anson, C., Gonyea, B., and Paine, C. Using results from the Consortium for the Study of Writing in College. Webinar handout. National Survey of Student Engagement, 2009. Bean, J.C. Engaging Ideas. San Francisco: Jossey-Bass, 2011.